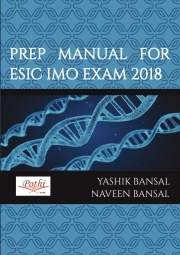 Description of "Prep Manual For ESIC IMO Exam 2018"
Book for ESIC IMO Exam 2018. Contains authentic questions along with answers from ESIC 2016 and ESIC 2014 exams. Covers the most commonly asked topics in ESIC IMO exam. Reviews of "Prep Manual For ESIC IMO Exam 2018"